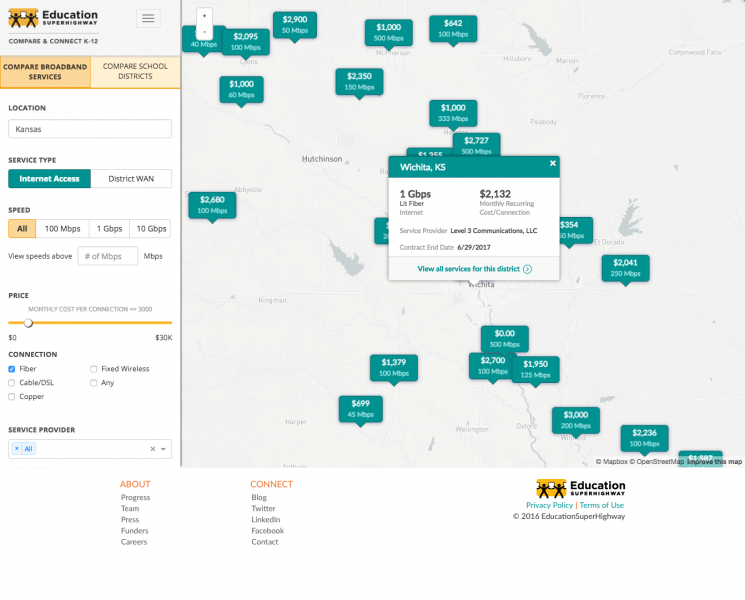 Compare & Connect K-12, a free website that allows school district officials to weigh how much they pay for broadband services against neighboring districts’ costs, was launched today by the nonprofit EducationSuperhighway. The tool can be used to show state and district leaders the prices paid for specific bandwidth speeds, and which company provides that broadband service. Comparisons can be made in speciific regions or in any state across the United States. Operating in a beta form since January, the site has already been used by school officials to negotiate better deals for internet connectivity, according to Evan Marwell, the CEO of EducationSuperhighway, which is focused on providing internet access to every public school classroom in the country. About 13,500 districts are represented on the site, and nearly 6,600 service providers, the organization said. The data used for Compare & Connect K-12 is culled from the E-rate applications schools submit for approval to the federal government for their annual funding allocation. The E-rate program subsidizes schools’ use of broadband through funds collected as fees for telecommunications services. EducationSuperhighway then verifies the data in every application before it is published on the site, Marwell said in a phone interview. Typically, a district might see that it pays, for instance, $2,000 for per month for a specific bandwidth speed, then discover a neighboring district is paying $1,000 for the same amount, Marwell explained. Rather than ask for a rate reduction, the district is likely to negotiate for more service for the same fee, he said. “For a school district that’s implementing technology in their classroom, they don’t need to save $1,000 a month–for which they’re probably paying only about $300 per month” because of the E-rate subsidy, he said. Instead, they need the bandwidth upgrade to improve digital learning opportunities by providing more high-speed connectivity. One Montana district identified by the organization—Great Falls Public Schools—used data displayed on the beta version of the website to compare the price it was paying with what nearby districts paid. This information gave them the ability to negotiate a long-term contract for 330 percent more bandwidth, while paying only 8 percent more per month, EducationSuperhighway said in its release. “If you look at the data of what’s happened last year to this year, we see a recurring theme of districts getting a lot more bandwidth for spending the same amount of money,” Marwell said. Broadband service providers can use Compare & Connect K-12, too, to find out where they might expand their market by looking for which competitor is selling what level of service to districts in their coverage area, and for how much. Marwell said he anticipated that there might be some resistance from internet service providers to price transparency. Instead, with the new comparison tool, “service providers can see it as a lead generation channel for them. They have a tool where they can go and see which districts said they need an upgrade, and which districts are buying from one of their competitors,” where they might offer a better deal, he said. Compare and Connect K-12 also gives recognition to service providers that help their school district customers meet the minimum connectivity goals in 100 percen of their districts. Marwell said his goal is also to get more bidders in rural districts., where there is often only one provider responding to RFPs. For ed-tech companies, the site shows which districts are using technology in their classrooms, and which ones have the most bandwidth, said Marwell. By looking at bandwidth, businesses can also learn which districts would be most likely to support the internet demands of a given product, such as one that uses video, for example. Much of the funding for schools’ connectivity is provided through the federal E-rate program, which allocates fees from consumers’ phone bills for this purpose. In 2015, the Federal Communications Commission increased funding by $1.5 billion and overhauled the mechanics of the E-rate to prioritize broadband and Wi-Fi connectivity while phasing out support for older technologies. The Democratic majority on the commission prevailed in the 3-2 vote to increase fees by about $1.90 per year per phone to pay for modernizing internet access to schools and libraries. Although the vote was partisan, the idea of price transparency was supported by all the commissioners. Marwell said he does not expect President-Elect Donald Trump to diminish the E-rate program. “Any time you have political change, there’s always potential for things to change,” he said. But Trump has mentioned blended learning, and “without E-rate, blended learning is going to be difficult in schools,” Marwell said.